Colours: All black ninja, or my personal favourite, Black with Kill Bill yellow zips! This is one of the most versatile pieces of clothing I’ve owned in the last few years. It does the job of about 3 layers in one, especially when you deploy the speed-skater hood! It’s super light weight, easy to wash, and steezy to rock; ‘Japanese B-boy’ was my most recent compliment. The PowerStretch fleece on the forearms really does hug your musculature in such a way to enable a good blood flow to the hands, keeping them warm without much need for gloves. And as an added bonus, the thumb-holes in the sleeves means at least half of your hands are covered in fleece. Sounds minimal, but covering your hand with just a little more PowerStretch really tells your body that warmth is on its way. Plus it’s faster than putting on gloves. It’s little practical advantages like this that really make performance clothing worth the investment; cutting out the faff so you can have more fun instead. Personally, I really dig using this insular layer when out amongst mother nature. A recent chainsaw wooding mission comprising of pressing and hauling heavy logs was complimented by the free range of motion I experienced in the shoulder region. The fitted nature of the jacket means you can get away with the most complex of movements, without worrying about snags or restrictions; a must have for any outdoor activist. So it’s chilly out there. You’re belaying your main man as he scales a 30m stack of polished limestone, trying to keep the bloodflow to your toes. Deploy the hood, poke thumbs through sleeve and add a hat to the mix, it’s only a matter of minutes before your core temperature starts to rise. Back to the task at hand. 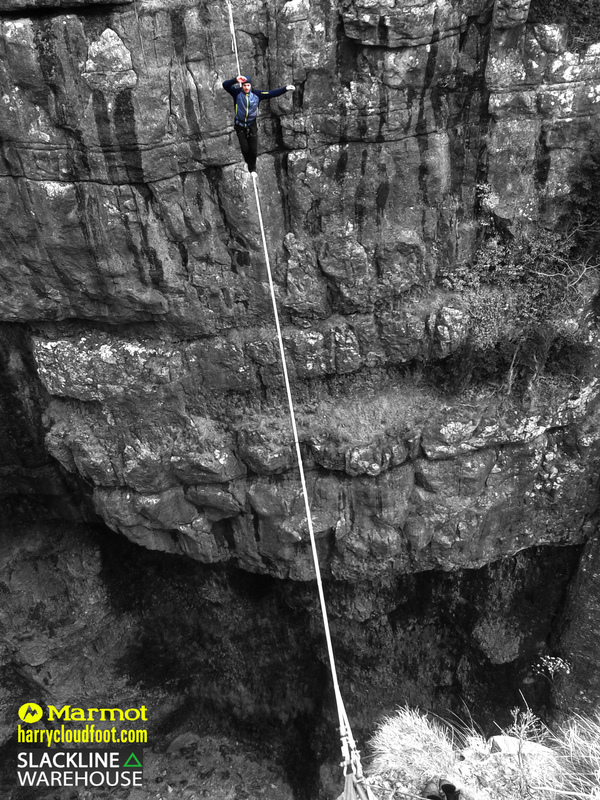 I actually scaled said wall in the Yorkshire Dales, seconding a fairly simple, yet dauntingly tall trad route (my second trad climb) wearing the Alpinist Hybrid. I didn’t need the hood or the sleeve extensions, and unzipping the collar just a touch meant that my body temp stayed balanced for the entire duration of the climb. No rips or tears to the PRIMALOFT front, either. The ultra reflective Marmot logo works a treat – camera flashes and even car headlights pick up the jacket from a distance. I’ve been using the side arm pocket for handies such as my head torch and even for my Ipod – ideal for working out. When highlining, I just switch to the inside zip pocket to make sure no wires are in the way. This entry was posted in Gear Reviews, Slacklining and tagged Alpinist, Climbing, Clothing, Gear, harry cloudfoot, Hybrid, Insulated, Jacket, Kill Bill, london, Marmot, ninja, Performance, PowerStretch, Primaloft, Review, slackline, slacklining, Store by harrycloudfoot. Bookmark the permalink.